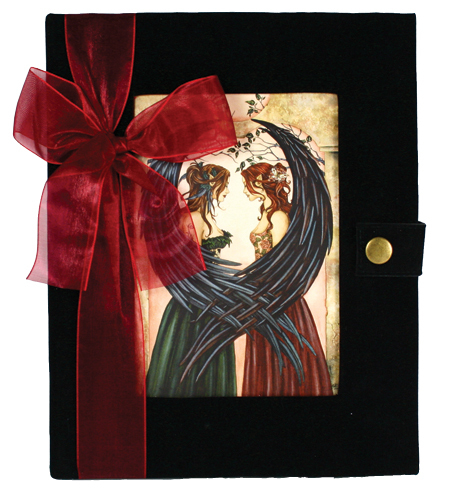 These black velvet journals feature the artwork of Amy Brown upon the cover! Choose between four designs by Amy, showcased as a full, vibrant color inset within the front cover. Measuring 5" x 7", the books feature a matching colored organza ribbon tied down the front binding for a beautiful extra touch. An antiqued metal butterfly button snap clasp keeps the journal safely closed when not in use, and the book comes in a clear sleeve for protection. 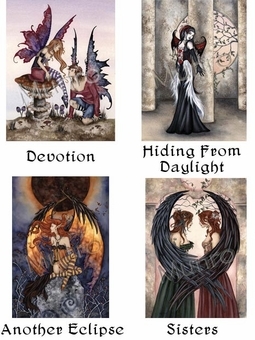 Each book is 8" x 10" x 3/4" thick with 50 pages of ivory parchment paper inside (no lines, slight texture). 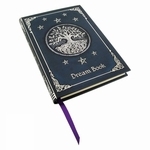 One of these journals would make a fine poetry book, Book of Shadows, sketchbook, or just jot down your thoughts and ideas within the high-quality pages! Please choose from one of Amy Brown's images for the cover of the journal. For a detailed picture of each image, click on the small picture.